May 4, 99 years after the historic 1919 movement for democracy and modernisation in China, was the date of international solidarity demonstrations organised by the international campaign, Stop Repression in Hong Kong. The demands of the protesters were against manipulation of elections and banning of candidates in Hong Kong, and against attacks on freedom of speech and other democratic rights. Posters of Xi Jinping with the slogan ‘End one-party dictatorship’ were held at several of the protests. Others held posters of disqualified Hong Kong legislator ‘Long Hair’ Leung Kwok-hung with the slogan ‘Stop political persecution of Leung Kwok-hung’.May 4, 99 years after the historic 1919 movement for democracy and modernisation in China, was the date of international solidarity demonstrations organised by the international campaign, Stop Repression in Hong Kong. The demands of the protesters were against manipulation of elections and banning of candidates in Hong Kong, and against attacks on freedom of speech and other democratic rights. Posters of Xi Jinping with the slogan ‘End one-party dictatorship’ were held at several of the protests. Others held posters of disqualified Hong Kong legislator ‘Long Hair’ Leung Kwok-hung with the slogan ‘Stop political persecution of Leung Kwok-hung’. On Friday, 4 May, protests took place in more than 25 cities in the following countries and jurisdictions: Australia, Belgium, Brazil, Canada, Catalonia, England, France, Germany, Malaysia, Mexico, Scotland, Spain, Sweden, Taiwan, USA. Protests took place outside the Ministries of Foreign Affairs in Spain (Madrid) and Mexico (Mexico City), and at China’s embassies or consulates in Edinburgh, Sao Paolo, Gothenburg and also at London’s Economic and Trade Office of the Hong Kong SAR government. Leaflets in Chinese from the campaign have also been distributed at universities and Chinese communities in Belgium, Britain, Canada and Sweden to reach out to mainlanders. This is the second round of international protests organised by the campaign, the first in October 2017. Jaco Lam, an organiser for the campaign said the protests reached more cities this time. “Our plan is to increase the pressure internationally, from grassroots people and youth, students and trade unionists,” he said. “We don’t believe in pressure from governments because they are too friendly with the Chinese dictatorship – they only care about business and profits, not about democratic rights,” Lam said. 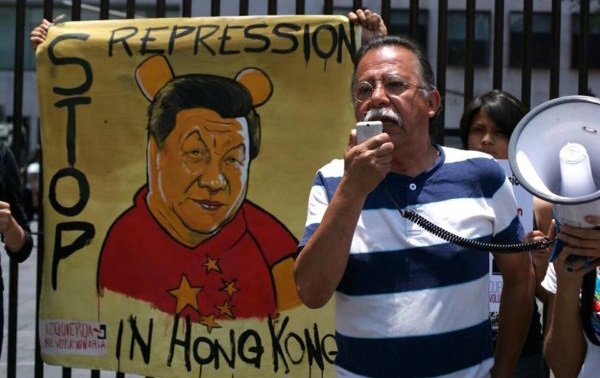 The campaign’s online petition opposing Beijing’s attacks on democratic rights in Hong Kong has been signed by hundreds of activists from labour and social movements in all continents including American historian and social activist Noam Chomsky. Other signatories include members of parliament in Ireland, Denmark and Germany, leaders of national student movements in Spain and Malaysia, and leading trade union figures in England, Brazil, Hong Kong and South Africa. chinaworker.info wishes to express its appreciation to all who are taking part in the international protest actions, and especially to highlight the important role played by members of the Committee for a Workers’ International (CWI).